Sissy-Bar Tube Kawasaki VN 800 Vulcan et Kawasaki VN 800 Vulcan Classic Highway-Hawk Custom Chrome. Sissybar Kawasaki Custom - Sissybar Kawasaki Highway-Hawk - Sissy-Bar - Couleur Chrome. 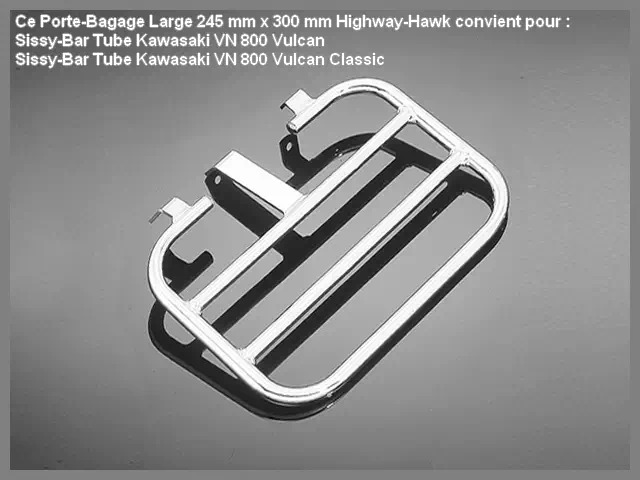 Sissybar Custom Kawasaki Tube pour : Kawasaki VN 800 Vulcan, Kawasaki VN 800 Vulcan Classic. 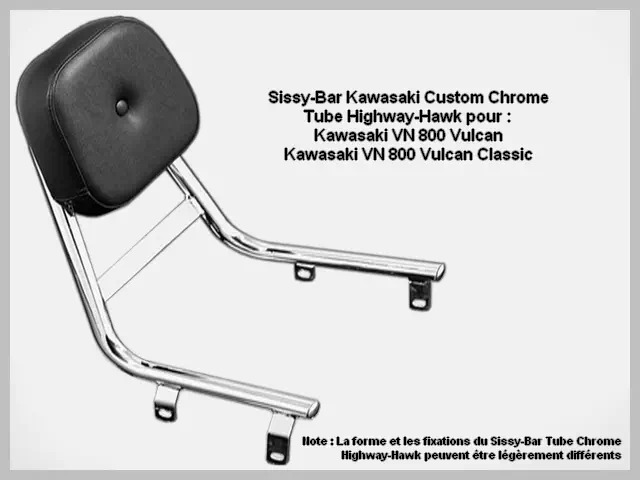 Description : Sissybar Tube Kawasaki VN 800 Vulcan et Classic en Tubes Cylindriques Chrome Coussin de Dossier Confort - Hauteur du Dossier Passager depuis le Garde-Boue : 350 mm, Sissybar en Acier Chromé de Haute Qualité, Porte-Bagage en Option. Pour Custom Japonais Kawasaki VN 800 Vulcan et Kawasaki VN 800 Vulcan Classic - Autres modèles pour : Honda - Yamaha - Suzuki. Pur Esprit Custom. 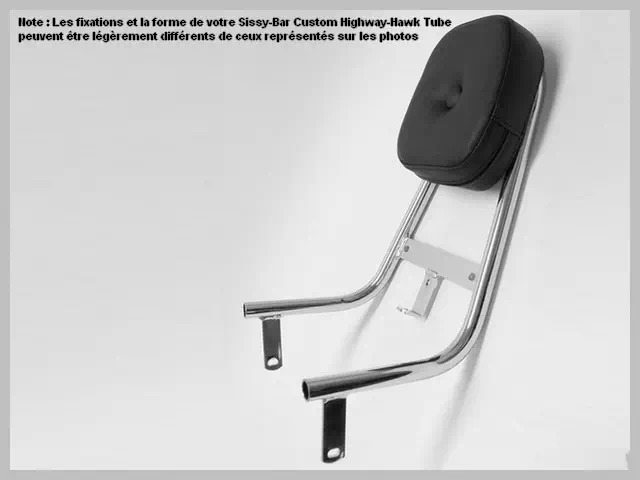 Highway-Hawk : une marque de référence pour votre Sissy-Bar Kawasaki Custom. Sissy-Bar Tube Custom Kawasaki VN 800 Vulcan et Kawasaki VN 800 Vulcan Classic Highway-Hawk Custom Chrome. Sissy-Bar Custom Kawasaki en Tubes Ronds Chromés pour Kawasaki VN 800 Vulcan Classic. 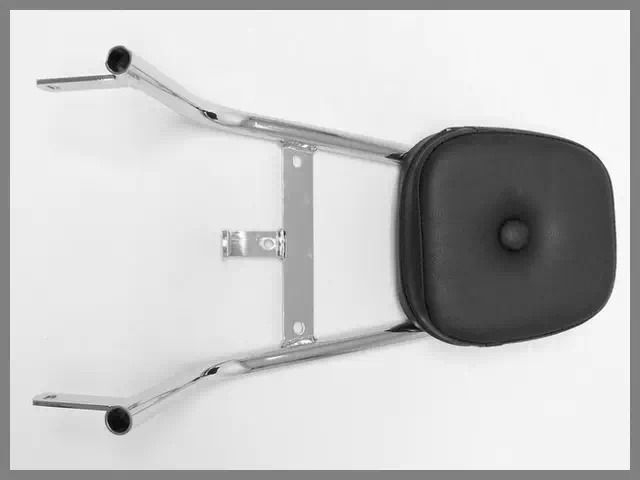 Description : Sissybar Tube Kawasaki VN 800 Vulcan et Classic en Tubes Cylindriques Chrome avec Coussin de Dossier Passager "Confort" - Hauteur Approximative du Dossier Passager depuis le Garde-Boue : 350 mm, Sissybar en Acier Chromé de Haute Qualité, Porte-Bagage en Tubes Chromé disponible en Option. Pour Custom Japonais Kawasaki VN 800 Vulcan et Kawasaki VN 800 Vulcan Classic. Autres modèles pour : Honda - Yamaha - Suzuki. Pur Esprit Custom. 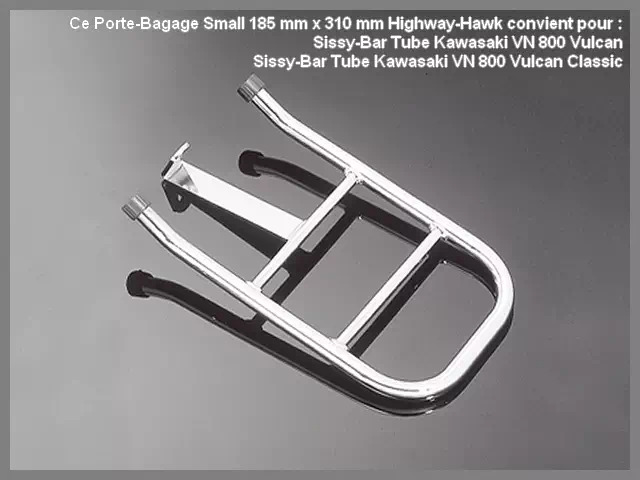 Osez le look "Low Rider Biker Choice" avec ce Dossier Passager Tube pour Kawasaki VN 800 Vulcan et Kawasaki VN 800 Vulcan Classic. 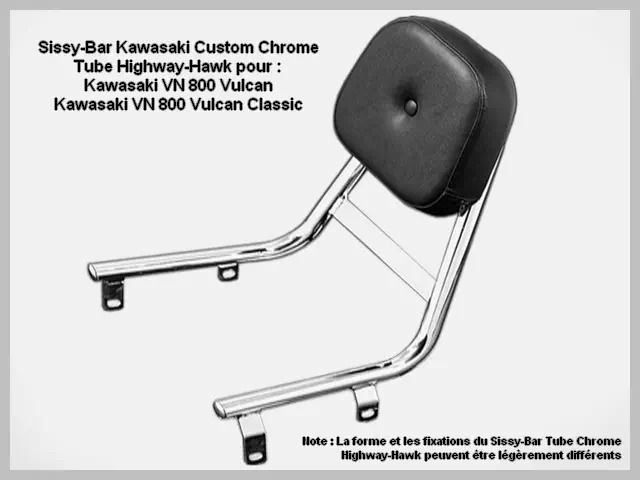 Sissybar Tube Kawasaki VN 800 Vulcan et Kawasaki VN 800 Vulcan Classic Highway-Hawk Dosseret Passager Kawasaki Custom. Moto Custom Kawasaki, Accessoire pilote et passager de Kawasaki Custom, Big-Bike, Cruiser, Basique, Bobber, Chopper, Café-Racer, Etc. 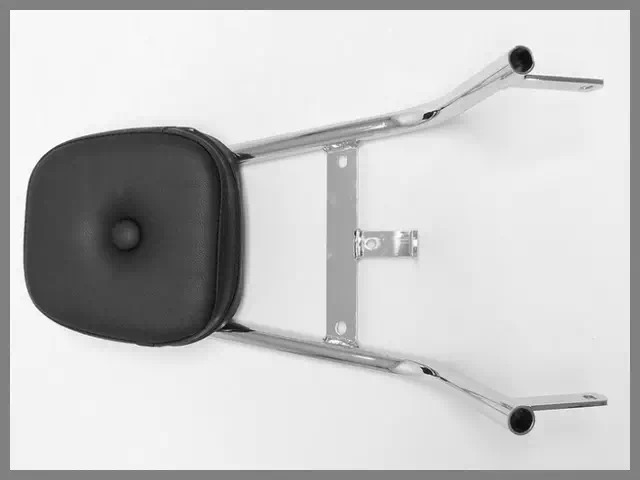 Pose très facile, notice de pose incluse pour montage sur votre Kawasaki Custom. Moto Custom Kawasaki - Autres Modèles pour : Custom Japonais. 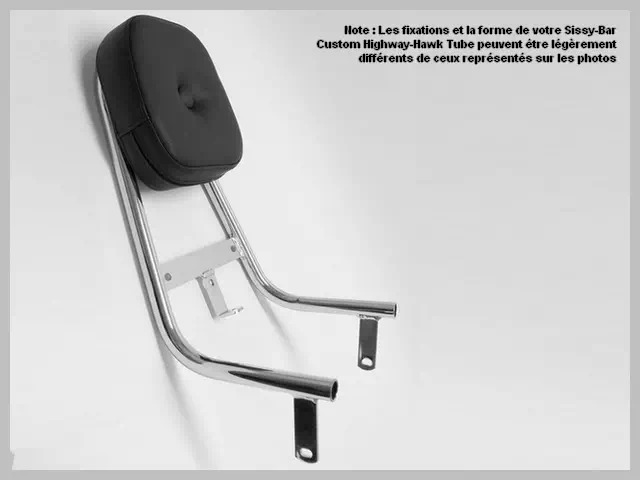 Kawasaki Custom, Catalogue 2015 Accessoires et Pièces Chrome Highway-Hawk.